The University of California operates the largest academic library system in the world. It manages more than 34 million items in 100 libraries on ten campuses. The purpose of these libraries is to assist research and instruction on the University of California campuses. 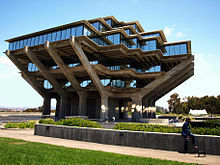 While each campus library is separate, they share (through the UC library system) facilities for storage, computerized indexing, digital libraries and management. For example, each campus maintains its own computerized library catalog and simultaneously participates in the systemwide union catalog, MELVYL. The UC libraries also manage a digital library, the California Digital Library. They also hold special collections and electronic archives of research documents. Special collections include historical archives on California history, federal depositories, law libraries, specialized collections for medical and scientific research, and a series of periodicals. A major concern of the library system is the rising cost of scientific journal subscriptions, and the costs of renting article databases. The library is leading an effort to publish science research online in a persistently-available electronic format, primarily through a digital repository called the eScholarship repository. The physical collections are scattered across the UC campuses. Their collections and stand-alone library buildings are listed below. In the 1980s, to relieve overcrowding in existing on-campus library buildings, the UC system constructed two regional library facilities: the Northern Regional Library Facility at UC Berkeley's Richmond Field Station (opened 1982), and the Southern Regional Library Facility on the western edge of the UCLA campus (opened 1987). As of 2007, Northern Regional Library Facility is home to 4.7 million volumes, while SRLF is home to 5.7 million. Each facility receives items from all UC campuses in its respective region of the state, and has climate controls and high-density stacks. Items are shelved two deep and are arranged in a sequence that results in efficient use of space (but is not quite as intuitive as traditional library indexing systems). As a result, casual browsing is prohibited, and the shelves are accessible only by library clerks trained to retrieve and put back items properly. Users must page materials to an on-site reading room or to a library at their home campus. Davidson Library at UCSB is undergoing major renovations as of 2013. The UC library system has open stacks at most libraries, and permits free research and reading by the public. In addition, all campuses allow any California resident to apply for a library card and thus gain limited borrowing privileges for libraries on that campus, although there is typically a charge for these cards. Materials may be borrowed between the UC campus libraries or from the regional library facilities through interlibrary loan; it is generally possible for a student or other university associate to order a nonfragile, unreserved item and have it within a few days. Books may take between a day to a week to be delivered between campuses. 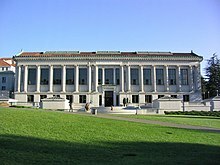 The Librarians Association of the University of California (LAUC) is the statewide organization of librarians employed at least half-time in the UC Library system. Each campus also supports its own division. Librarians are academic appointees but not faculty. LAUC's objectives are to: advise the University on professional and governance matters, to make recommendations concerning UC librarians’ rights, privileges, and obligations, and to promote full utilization of UC librarians’ professional abilities. LAUC also awards research grants to its members to support librarian research and professional development. ^ University of California Cultural Resources - Libraries Archived 2008-01-23 at the Wayback Machine. Accessed January 26, 2008. ^ "UCLA Library Locations". UCLA Library. UC Regents. This page was last edited on 16 December 2018, at 22:43 (UTC).